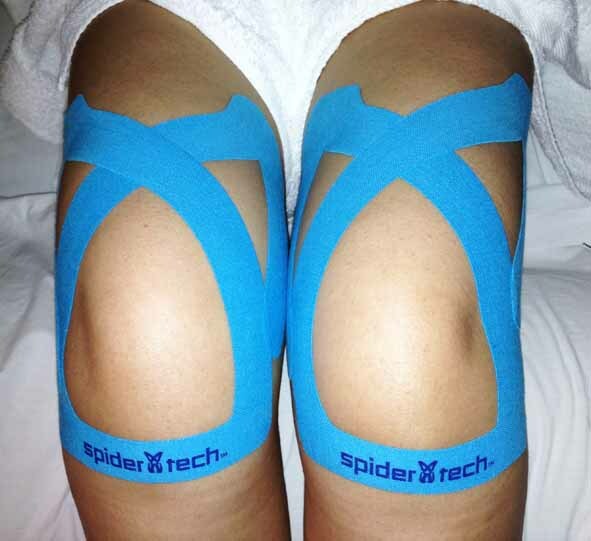 Our Chiropractors often use Kinesio Tape or Spider Tech tape to treat some of our patients with amazing success. This is a coloured tape which has a texture and elasticity very close to the human skin. It is used on areas of the body affected by athletic injuries and physical problems mainly around the joint and muscles. When applied correctly by a Chiropractor or Physiotherapist this unique tape can help the body’s natural healing process while allowing support and stability to muscles and joints without restricting the body’s range of motion and increasing proprioception. Proprioception is the way our brain knows where each part of our body is. It’s a subconscious sense without which we would be falling and bumping into things. This tape improves proprioception through the stimulation of nerves serving our fascia. It also improves microcirculation increasing blood flow to the injured area which helps the healing process. After chiropractic treatment, physiotherapy and application of this tape on the effected area, often patients can still take part in sports and physical activities while the body is healing. Many famous athletes such as David Beckham and Serena Williams have been seen with taping treatment while competing in tournaments. Our chiropractors use taping in conjunction with other treatment methods such as chiropractic, physiotherapy and non-surgical spinal decompression therapy. It can help patients suffering from injuries such as Plantar Fasciitus, Achilles Tendonitis, Bicep Tendonitis, back injury and many more problems, helping to reduce pain, inflammation, relax tired muscles and support muscles in movement.